Commercial HVAC services are as important as residential HVAC services here in Louisiana. Our summer days are long and hot, with a high amount of humidity thrown into the mix. It’s bad enough when we’re home, but most of us spend our days in a commercial space such as an office building or small business site. Commercial HVAC systems may have specific needs that should be met, such as the ability to run industrial refrigerators in restaurants. And if you own a business or manage an office space, you need to move quickly in the event your system runs into trouble. What are the Benefits of Modular Rooftop Commercial HVAC Units? Business owners and office managers in Destrehan, LA have to keep their space cool, not only to help attract customers, but to keep employees comfortable and happy as they go about their jobs. A quality commercial HVAC system is an absolute necessity in our climate, but where do you put such a large system on your property? The answer can usually be found on the root, where modular HVAC units can be placed to do their jobs. There’s a lot of huge benefits to that kind of set-up, which any prudent business owner should keep in mind. Posted in Commercial HVAC | Comments Off on What are the Benefits of Modular Rooftop Commercial HVAC Units? Why Are Commercial HVAC Systems Modular? If you own or operate a business here in Hammond, LA, then heating and air conditioning systems are a high priority for you. You need them to function at the top of their game every day, lest they fail just when you need them the most: driving away customers and leaving both employees and vital equipment like computers significantly worse for wear. 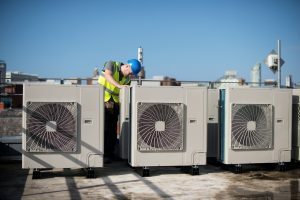 You may have noticed that most commercial HVAC systems adopt a modular approach: using numerous smaller units, usually mounted on the roof, instead of one larger unit which you typically have in a residential building. Why are commercial HVAC systems modular? As with many aspects of business, it’s the most expedience means of doing the job. Posted in Commercial HVAC | Comments Off on Why Are Commercial HVAC Systems Modular? When you own commercial property, it is your responsibility to keep that property comfortable throughout the year for all of your clients, customers, employees or tenants. Of course, when you use a mechanical system as much as you do your commercial HVAC system, you have to anticipate some operational problems from time to time. There is no way to completely avoid the need for professional commercial HVAC repair in Hammond, LA. However, you can help to minimize any damages that your system suffers as a result of these problems. Here are a few tips from the HVAC repair technicians at A-Professional Heating and Air Conditioning to help you determine when to schedule professional commercial HVAC repair. While a complete breakdown of your commercial HVAC system is a pretty obvious sign that it is time for professional repair service, it is not always going to be so clear cut a situation. One important factor to keep in mind is the efficiency with which your commercial heating and air conditioning equipment operates. If you notice a sudden spike in the amount that it costs to heat and cool your commercial property, then it is very possible that there is a problem with its operation which is resulting in decreased energy efficiency. Only a professional commercial HVAC repair technician can determine with certainty what the cause of the problem is. You should also contact a commercial HVAC repair expert if you notice any strange noises or sounds during the operation of your system. While such irregularities may not seem like cause for immediate concern, it is very possible that such issues can indicate a much more serious problem in development. Remember, damage to your commercial heating and air conditioning equipment rarely, if ever, happens overnight. It is usually much more of a cumulative effect, and resolving any issues promptly is your best defense. Call today with any concerns you may have about the operation of your commercial HVAC equipment. Do not take any chances with your commercial heating and air conditioning system or the quality of its performance. Call A-Professional Heating and Air Conditioning at the first sign that you need commercial HVAC repair services in Hammond, LA. We’ll make sure that any problems are resolved completely.